The fastest and most precise method of creating openings in vertical concrete structures. This technique is commonly used to cut door and window cavities without damage to the surrounding wall. The wall sawing system consists of a track that supports a travelling bogie and circular steel blade with diamond segments. The track is bolted to the concrete surface, such as a wall or other steep incline. The bogie travels backwards and forwards along the track rails, powered by a hydraulic or electric motor. The cut is made as the blade makes a series of passes over the surface area. This method can be used to cut openings of up to 650mm deep. Used to cut horizontal flat concrete surfaces, such as roads, pavements, warehouse floors, airport runways, car parks, bridges and concrete slabs. Razor Cut can also saw through other solid materials, such as asphalt, stone, granite, brick, masonry and tile. Floor sawing is quick and efficient and often used when surface repairs need to be made in a short space of time. Like a wall saw, the system consists of a circular blade mounted on a spindle and powered by a diesel or petrol engine. An operator walks behind the unit as it moves along a flat surface. The diamond blade is capable of cutting up to 700mm in depth. 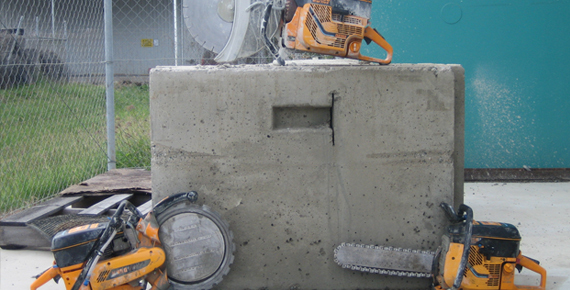 Ideal for removing large concrete structures and where other cutting methods are impractical. A beaded diamond wire is threaded through a series of pulleys attached to a drive wheel. 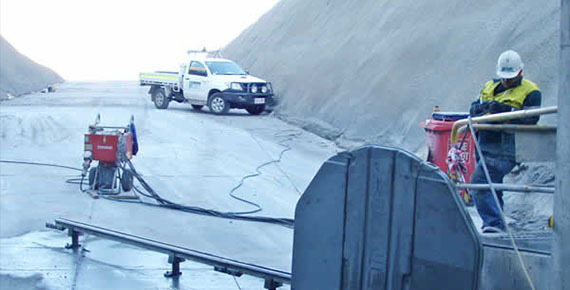 A constant pulling force is applied to the spinning wire to cut through the concrete. The diamond wire sawing system can be used to cut through vertical, horizontal, extruded and angled openings. The wire length can be easily extended for almost unlimited cutting depths. 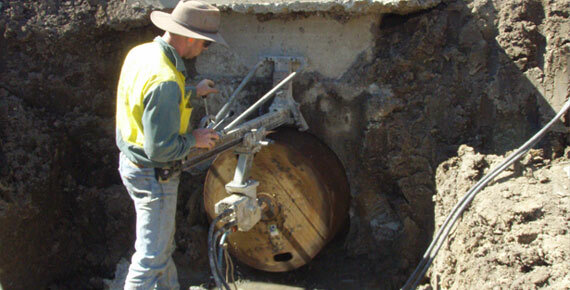 Diamond wire saws can be operated in confined spaces and are fast and emit low levels of noise. Wire sawing is versatile and suited to extracting large sections of heavily reinforced concrete, such as bridge sections, columns and beams. Core drilling is the most efficient way of creating holes and slots from 10mm to 1m in diameter, to virtually unlimited depths. Openings can be drilled through all types of concrete and brickwork for plumbing and electrical installations. It is also effective for creating holes for the installation of pipes and cables, anchoring bolts and load carrying devices. Drill bits are mounted on the rotating end of various drilling machines with diamond segments welded to the drilling end. Powered by electric or hydraulic power systems, this technique ensures low noise output and is dust-free. 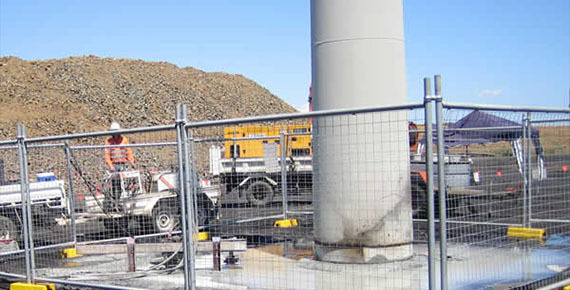 Machines can be operated in horizontal, vertical and inverted positions for use in confined spaces. For large or abnormal openings, a technique called diamond stitch drilling is used, whereby a series of adjacent holes are drilled to form the opening. 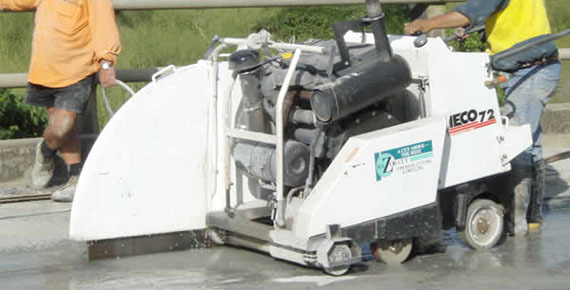 Razor Cut can polish old or new concrete slabs. 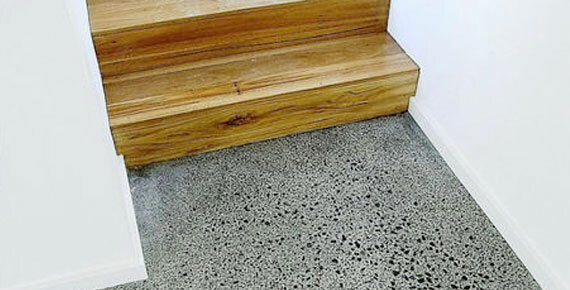 The polishing process will reveal the stone in the concrete to give you an appealing gleam. You can colour new concrete mix or even seed the top of the slab with coloured glass pieces or other objects, such a nuts and bolts, to create a striking effect. The combinations are only limited by your imagination. Using new diamond grinding technology, HiPERFLOOR transforms existing and new concrete surfaces into a beautiful high-gloss, mirror like polish. HiPERFLOOR is high performance and environmentally friendly, adding value to this long-lasting finish. Both techniques are ideal for cutting door and window openings. The diamond chainsaw resembles the woodcutting chainsaw, except the chain is fitted with diamond segments. The handheld chainsaw is quick and efficient to operate and is used for straight line cuts with right-angle corners. The ring saw design is based upon an angle grinder. Like the chainsaw it is a handheld device, powered by hydraulics or a petrol engine that require a water supply. The depth of the cut is determined by the diameter of the diamond blade. The hydraulic saws are fairly quiet to operate and vibration free. These handheld portable devices are ideal for construction and demolition sites where access or workspace is limited. With the demanding call for confined space demolition, the Husqvarna Remote Controlled Demolition Robot packs many times the hitting power of a jack hammer in a unit small enough to fit through a doorway as small as 780mm in width. The lightweight, precision digital remote control allows our trained operators to operate the machine at a safe distance from the work area. In using the latest technology, our Husqvarna robotic demolition machines are ideal for working in environments where point loading, noise, access and toxic fumes are a problem, i.e. inside shopping centres, hospitals, banks, office buildings, kilns, etc. With three easily changeable attachments and the ability to manoeuvre on rubber tracks, our Husqvarna machine can cope with all terrains even if you have to climb stairs.